If you missed part 1 of this series, you should check it out. 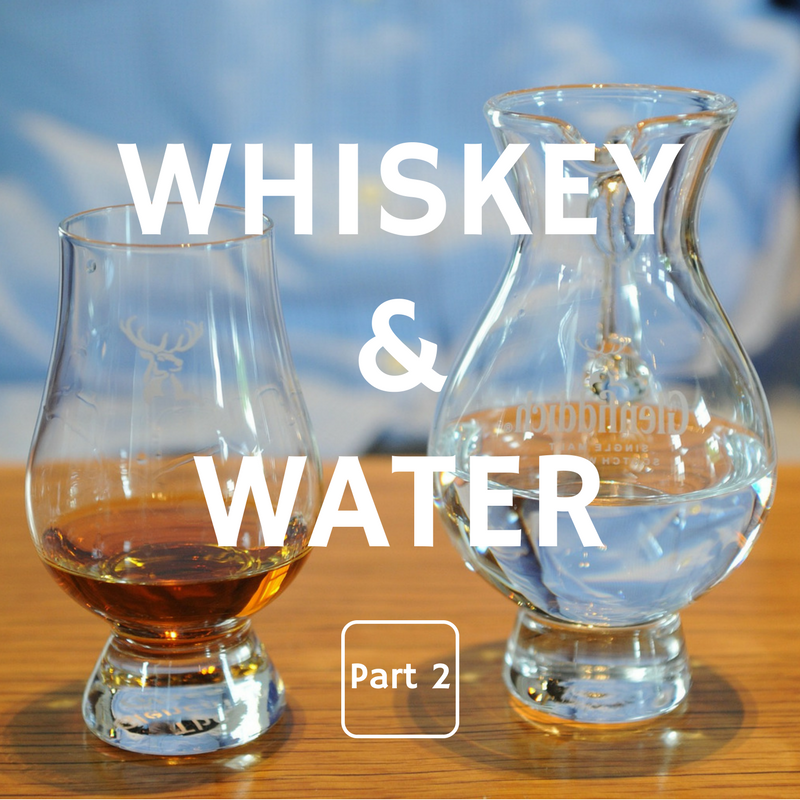 In part 2 we’re going to answer the question: What happens when you add water to whiskey? The simple and annoying answer is; it changes the whiskey. But we’re not here to annoy you, and you want more than simple. Why? Because you know the deeper you understand your whiskey, the more you’ll enjoy it. So then, how does whiskey change when water is added? In two ways. First, by lowering the proof. Second, by releasing aromatic compounds. Let’s look at those in more detail. We’ll analyze what’s going on in the glass, and what that means for your tasting experience. Adding water lowers the proof – or alcohol concentration – of your whiskey. Does that mean after adding water there’s less alcohol in your whiskey? No, there’s the same amount of alcohol, but less alcohol by volume. Alcohol – more specifically ethanol – is the main culprit in the “burn” associated with whiskey. Whiskey’s burn is actually ethanol setting off pain receptors in your mouth. Adding water lowers the ethanol concentration and reduces the burn. So what does that mean for flavor? How does it affect your tasting experience? A little burn can be enjoyable, like enjoying spicy food. No matter who you are, though, if the burn level crosses your pain threshold, then that’s all you’ll be able to focuses on and you’ll miss out. Adding a little water fixes that by lowering the proof and allowing access to the flavors hiding behind the ethanol. That’s like asking, how much salt should you add to your food? It’s a personal preference. We all have different tolerances for whiskey’s burn. If bottle strength tastes good to you, then go for it. If it burns too much, then add half a teaspoon of water at a time until it doesn’t burn. A word of caution: Just like it would be silly to salt your food before tasting it, you should taste your whiskey before adding water. Water irreversibly changes your whiskey and once added, can’t be taken out. So proceed thoughtfully. What else does water do to whiskey? Adding water releases aromatic compounds, that are otherwise unavailable. Here’s where we get into some cool whiskey science. They’re made up of uniquely scented molecules that, for one reason or another, bind together in a group and create an aromatic compound. These compounds smell different than the individual molecules that make them, much like a sauce smells different than its ingredients. For example: ketchup, mustard, cayenne pepper, brown sugar, and liquid smoke all have a unique smell. Mix those elements together, though, and you get a new compound smell – barbeque sauce. There are two types of aromatic compounds. Water soluble and water insoluble, or in other words, compounds that water breaks apart and compounds that it doesn’t. Both types are in your whiskey. So what happens when you add water? Two things. First, water soluble compounds break apart, rise up on ethanol vapors, and greet your nose in their individual parts. That’s why water is said to “open up” your whiskey. In an illustrative way, this would be like adding a few drops of water to barbeque sauce and then smelling ketchup, mustard, cayenne pepper, brown sugar, and liquid smoke individually. In a practical way, you’ve experienced this if you’ve ever noticed how different is smells outside after a fresh rain. Second, water insoluble compounds get heavier, and so their aromas are repressed because they don’t readily rise up the ethanol vapor stream. What does that mean for flavor? How does it affect your tasting experience? It means whiskey tastes different after adding water to it. Different? Don’t I mean better or worse? No, I mean different. Again we’re dealing with personal choice. It really depends on if you prefer the aromas that are released, or the ones that were suppressed. So how do you know what to do? This is the fun part! Try your whiskey both ways. In short order you’ll figure out how you prefer it. Or if you’re like me, you’ll always drink it both ways because you love exploring the differences. Speaking of differences, what happens when you add ice to whiskey? We’ll cover that in part 3.